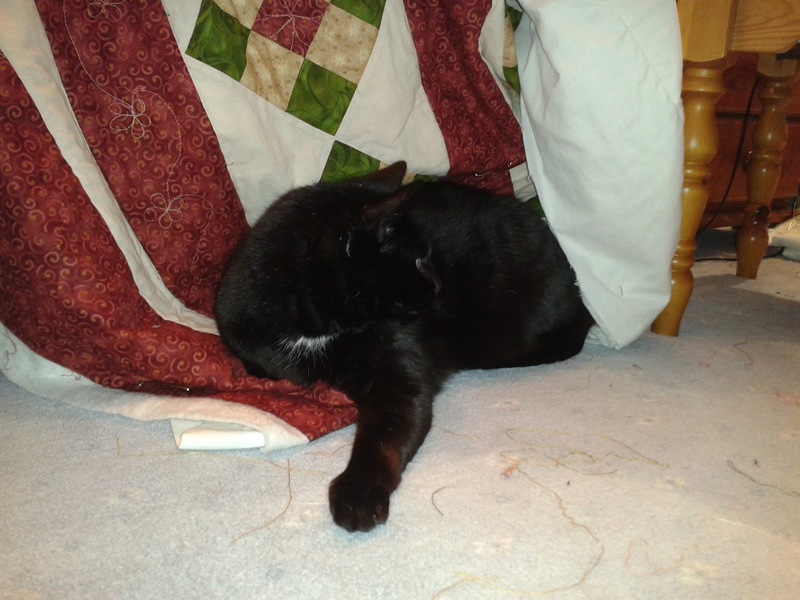 I was looking forward to making more progress on Mum's Quilt this afternoon - I took a coffee upstairs, turned the radio on, made sure the heating was on, re-threaded the machine (after turning up a couple of pairs of trousers in the week) and settled down. I doodled away at the border daisies for an hour or so, making good progress, but then started to feel the quilt not moving as well as it should under the machine - like it was snagging on something. Closer inspection revealed Oliver cat also enjoying quilting. 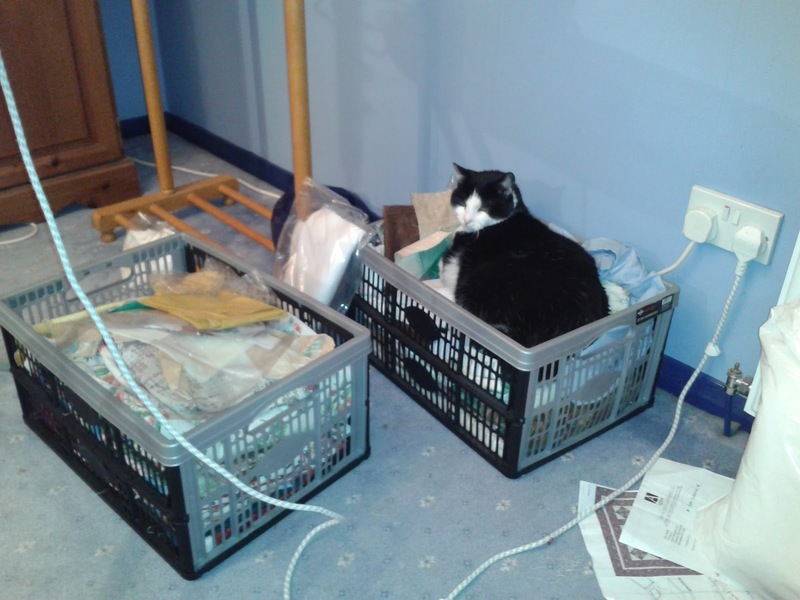 No matter, I didn't want to disturb him, so I thought I'd take the opportunity to cut the background fabric for the Christmas QAL - I'm behind here as I changed my mind after February's QAL session, and so could do with getting the fabric out from the fabric crate and getting that done. Ah. Perhaps not. 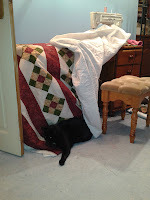 Domino cat has found the fabric first. Love 'em to bits, Mrs P! I'm laughing out loud, Hazel. Love Domino and Oliver. They apparently go where you go. I tell people I take Moxie with me whereever I go because I always seem to find cat fur on me someplace. They are very nosy, and have to see what I'm up to! This time of year they are shedding like mad - cat hairs all over the place! I meant to tell you that the stitching looks beautiful. Smart cats you got there! Soft fabric, comfy batting - what's not to like? Your mum's quilt is beautiful. Don't worry about brushing black cat hair. 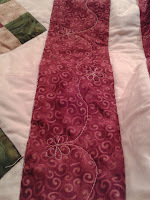 I tell people I sew with variegated thread - my special thread provides character! Happy quilting. Ha! I like that, Donna - I must do that too! LOL, they're not daft are they? The quilt's looking good. Thanks, Ali - I'm pleased with the daisy chains, less so with the doodled daisies in the blocks, but I think I'll live with them. What a clever pair they are. They obviously know what you are going to do next, so they go and get settled really close by!